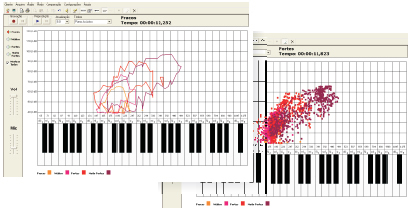 Vocalgrama is a software developed to analyze the vocal behavior of an individual in the control of the parameters of frequency and intensity of voice. In a simple way, it allows to evaluate the use of voice in speech (SRP - Speech Range Profile) and singing (VRP - Voice Range Profile). 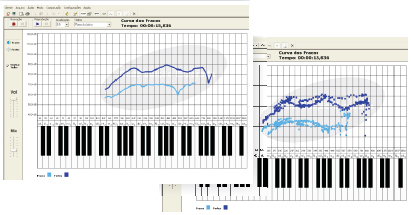 Furthermore, it provides vocal training and allows to obtain data of the fundamental frequency and durational characteristics of the emission, as the Maximum Phonation Time (MPT). Vocalgrama provides real-time visual feedback for sound intensity level (in dB) and pitch (in Hz) of the voice produced by the client and generates singing and speaking voice range profiles including the shouting voice mode. Vocalgrama allows the use of the frequency and intensity of emission in spoken voice (for instance - counting from 20 to 30). The different colors indicate the situations of speech, being orange for a soft voice, rose to normal, red for the loud and purple for very loud emission. There are two visualization modes, by points or by the area. It allows the use of the frequency and intensity of the singing voice, particularly using a sustained vowel /e/, registering the curve of the soft and loud. 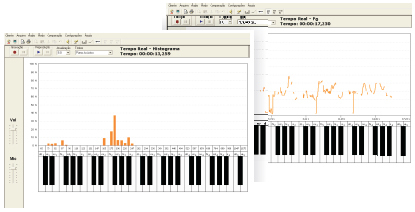 The program also allows to register note by note (Voice Range Profile), when necessary. The soft curve appears in the light blue and the loud in dark blue. In this mode you can use the program to work in real time with the voice pitch in tasks involving sustained vowel (frequency stability), reading text (melodic curve), or exercises, allowing the vocal/visual monitoring. The keyboard is activated to produce sound stimulus and guide the exercises for various purposes, such as training Vocal Function or the Lee Silverman voice treatment (LSVT). In this mode you can use the program to extract the frequency of an emission and its sustained Maximum Phonation Time (MPT). The reading appears directly in the window and you can select and train various vowels. This mode facilitates the archiving of data evaluation and allows the individual to understand the relationship between higher and lower emissions.